Monday was Aspens second year as a Delameter! I am so happy mom and dad brought her home to play with me because I was SO lonely and unhappy when I was home by myself all day. We like to go camping for our birthdays but this year mom and dad raced right home from work to watch some football game. It was nice to have us all there, together, but I would have rather been camping. 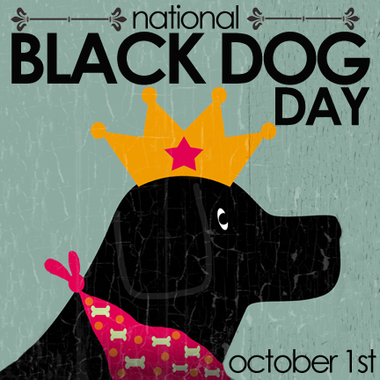 October 1st was National Black Dog Day! Can you believe it, we’re so special we have our very own day!!!!? We LOVE playing with other pups, so when we heard mom and dad say our cousins Lexi and Jenny were spending the weekend with us, we were SO excited! The weekend started on Friday night with a dinner party. Now, we never end up getting people food treats, so we didn’t expect to get to sample the chicken enchiladas, but we do love company and got even more pets than normal and, to be fair, we’re pretty darn spoiled!